El Mundo Safaris is a proud partner of Chile to Kili Foundation – a premier educational organization dedicated to discovering our planet, conserving and protecting environment and wildlife species. 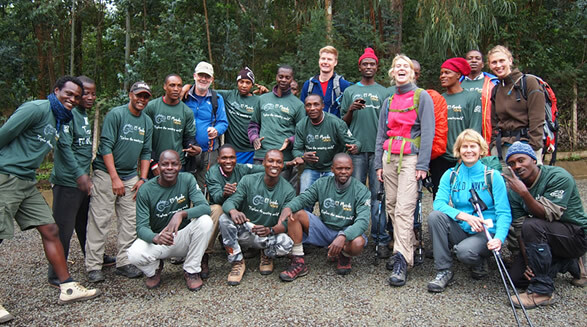 Our tour expeditions and adventure packages help to promote conservation and sustainable development. Chile to Kili Foundation was founded in 2007, promoting around-the-world cycling initiative undertaken by Elvis 'Lelo' Munis – that was partly inspired by Gandhi's famous quote “Be the change you want to see in the world”. Elvis had an experience of biking around 57 countries in an effort to inspire action to promote conservation and fund scholarships for the disadvantaged youth. We at El Mundo Safaris are passionate about offering travelers with active and highly-engaging packages that are environmentally responsible and incorporate adventure, education, leisure, cultural exchange, and exploration. We strongly believe in tourism promoting conservation and managing natural resources that give back to the local communities and offering travelers with highly-engaging as well as fulfilling experiences. 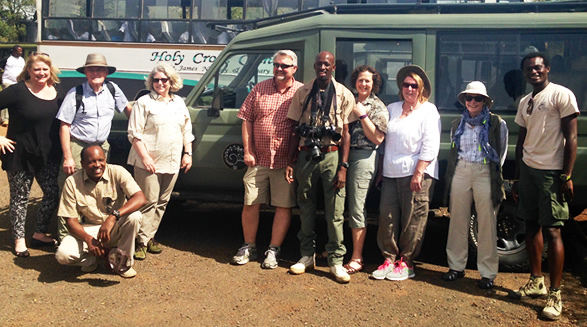 “Travel with a Purpose” is a key ethos of the company and El Mundo Safaris. We offer interested travelers the opportunity to participate, experience, engage, contributing, learning from local communities, people and the places visited. By traveling with a purpose we can all be the change we wish to see in the world. Africa, Tanzania and many other places in the developing world is home to a vast variety of bio and cultural diversity. Its home to a large variety of wildlife, rare ecosystems full of endemic species; is a harbor of pristine natural areas and natural resources. These are World Heritage sights. Sadly, many of its people lack the financial resources as well as inspiration and motivation to receive the education necessary to successfully manage, develop and preserve these resources and their respective areas. Let El Mundo Safaris help you make the most out of your expeditions! Elvis is inquisitive by nature and asks hard questions. How can we Africans best counter backwardness with personal development? How can we foster self-empowerment to combat poverty and dependence? 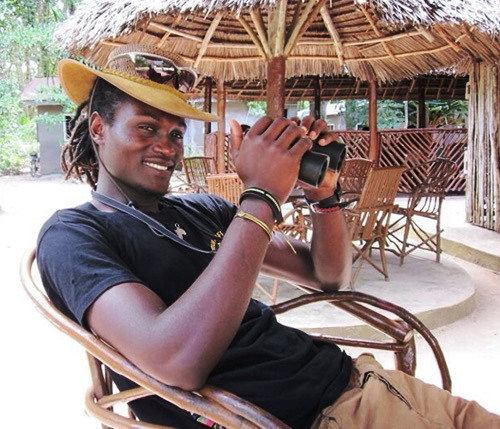 From a history of immersion in the local environment, he has spent time guiding wildlife safaris; leading treks up Kilimanjaro; working as a volunteer in several civil societies; solo cycling, leading long distance biking tours, and teaching Ecology to international high school and college students. He has emerged an intelligent and thoughtful naturalist and it is this spirit that drives his current endeavor. Elvis is once again using the power of his passion for what he believes in; Conservation-Education-Sustainability. It is with this passion, rich experience and determination that he leads his team of experienced guides, leaders, naturalists and trainers who will help you to achieve your own dream to learn about, experience and explore this amazing world! 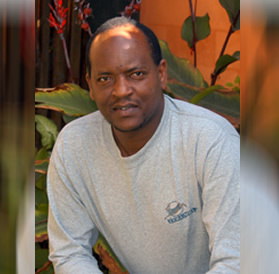 Semu, born and raised in Arusha with Ugandan roots, has been working in the East African safari circuit for more 20 years. When he began, safari companies were still using VW buses and having to pick up their guests from the Kenyan border, as there was not international airport in northern Tanzania. His years of experience have turned him into the superstar guide that he is today. He loves to share his vast knowledge of the region and its endemic species with his guests. Typically East African, he is warm, friendly and welcoming. 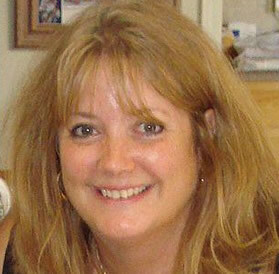 Lauralee has spent over 20 years in sales and marketing. In 1992, she decided to work exclusively in the travel industry. Over the years, she has developed strong industry relationships throughout the US. 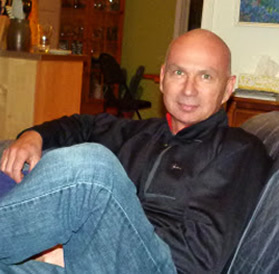 Garth is a world traveller who enjoys sharing his experiences with others. 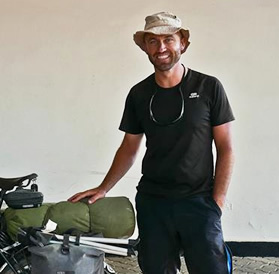 He has explored the world on two wheels, his first trip starting in Europe and taking him throughout the African continent. This is where he met Elvis. From then on, a fairy-tale friendship emerged and the two adventurers explored the furthest corners of the world together. Thomas Hart is a photographer and anthropologist from South Africa. 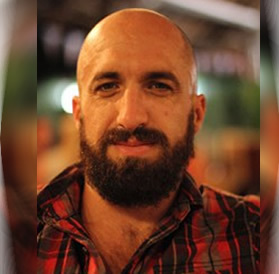 He has a Masters degree in Development Communication and has worked with Bushman communities throughout Southern Africa. He is a passionate historian in the development of Southern Africa, from the first humans at the Cradle of Humankind to the colonial era and Southern Africa today. Thus, he has a vast knowledge of Southern African history and culture and has traveled extensively around Africa working cultural and social projects. 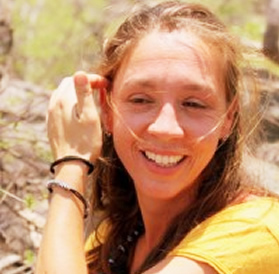 I am an experienced naturalist with a passion for Africa. Graduated from Lisbon University, I have started my professional path down south with an introductory course in Tanzania from where I engaged the track of tropical ecology. I have passed through Guinea Bissau, São Tomé and Principe, Equatorial Guinea and I am presently living and working in Mozambique. With a PhD in Biology/Ecology. I have an extensive experience in capacity building and environmental education and awareness, as well as a specialized touristic guide. I love to explore and discuss the natural world around us, even better if outdoors: walking, biking, kayaking or just sitting by the campfire. I was born in London, but grew up in a small village in Nottinghamshire with fond memories of my Raleigh bikes. In 2009 I began the Big Africa Cycle, cycling from England to South Africa. I finished in 2012, having cycled over 34,000km through 30 countries. At some point I might just cross over the Atlantic and embark on a trip through the Americas, but my current focus is to write a book about the African experience.